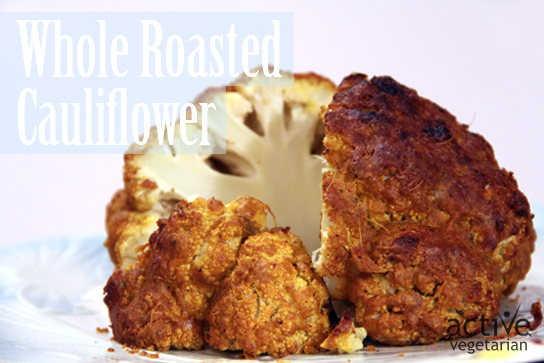 Hmmm…roasted cauliflower. 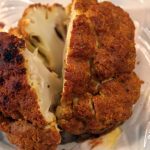 I find that this recipe turns even cauliflower haters into fans. So what makes this cauliflower “cheesy” but dairy free you may be wondering? No I did not use fake or imitation cheese (yucky). I used nutritional yeast, which is a healthy alternative to cheese that has a delicious nutty cheese flavor that will blow your mind, cheese lover or not. Amazingly delicious dish that’s as dramatic in presentation as it is easy in preparation. Serve it with a big green salad for an easy weeknight supper or your next vegetarian to dinner party. In a medium bowl, combine the oil,water, nutritional yeast and all spices,salt and pepper. Dunk the cauliflower into the bowl and use a brush or your hands to smear the marinade evenly over its surface.